Now that the last official bike race of the season has passed us by, its time to open the curtains a little to the world of race planning. I don’t think anyone is taking for granted the work Mike Crawford has done over the years, putting on hundreds of events for this community, but it can be nice to peek behind the curtain and see the process. The Chainwreck Cyclocross Series grew out of a few conversations about turning Polar Vortex into a true cyclocross event. Mike and I knew that to embed cyclocross culture in the area it would have to be more than a once a year event. Thus began my foray into race organization. It should be noted that I use the term race organization loosely. There are people in this world who organize races for tens of thousands of people. They pull in corporate sponsorship and get permits and allowances for use of public land. I’ve never been one for the mega events, and while there is a certain legitimacy that comes from having fancy barriers with dutch detergent companies names plastered across them, I prefer to think about the race itself. It begins like this. At some point every race begins as a concept doodled onto a map of Tsalteshi. There may be more efficient ways to plan, but this is how my mind works. 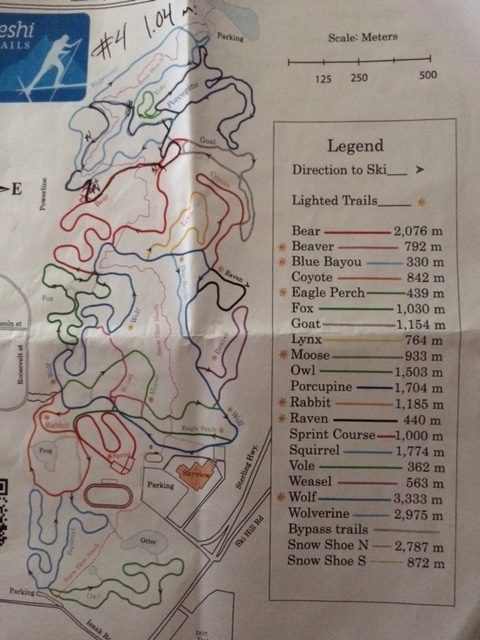 I sit down with a map of the trails, and look for interesting ways to connect them. Specifically for cyclocross races, I’m looking for routes that will be interesting, challenging, and compact. We may not have many spectators yet, but ‘cross is a very viewer friendly sport. The more times a course can cross back over itself the better. A compact course gives the spectators, photographers, and even the participants an opportunity to see racers multiple times per lap. I combine my knowledge of the trails and various features I have observed with the maps to draw out a rough plan. The next step is to ride the course. Without fail variations are made at this stage as we discover a cool cut through or challenging corners we can add to the race with minor deviations. Some of the most popular course features have grown out of a misreading of the map. We ride the course several times, adding in any tweaks or changes we have made, and then settle on a final design. These first two steps generally happen several weeks before the race in the case of the Chainwreck series. After we’re sure we have the course we want, we do a couple hot laps to estimate race pace. These hot laps tend to pop up on Strava a couple days before the race, giving Strava users a preview of the race. The night before the race I run through all the supplies needed for the next day. Barriers are checked for major damage and loaded into the truck. I make sure I have adequate tape, stakes and tools to lay the course out. Day of the Race. I usually head out the trails in the early afternoon. If I’m lucky I get to drive onto the course to drop off barriers and other heavy supplies that can be an encumbrance to set up otherwise. I’ll leave my truck as a staging area and survey how I want to lay out the course. The course is rarely assembled in a linear fashion. These courses are usually comprised of several different facets, and they all require their own trip around the course. Typically I lay in the taped sections first. 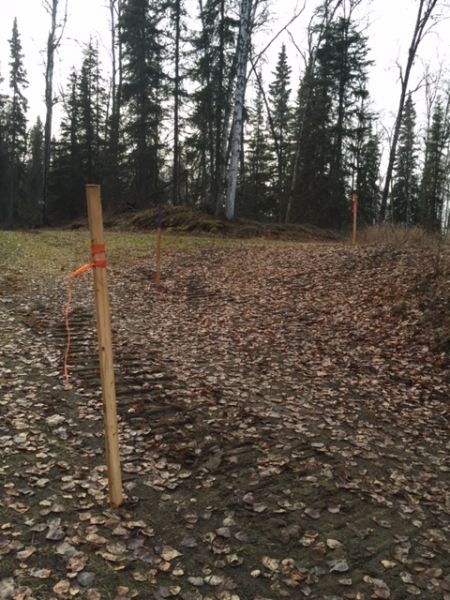 I use surveyor stakes and tape at various points of the course to more directly control how riders approach specific obstacles, or to create a route where there is none. There can be several reasons to do this. 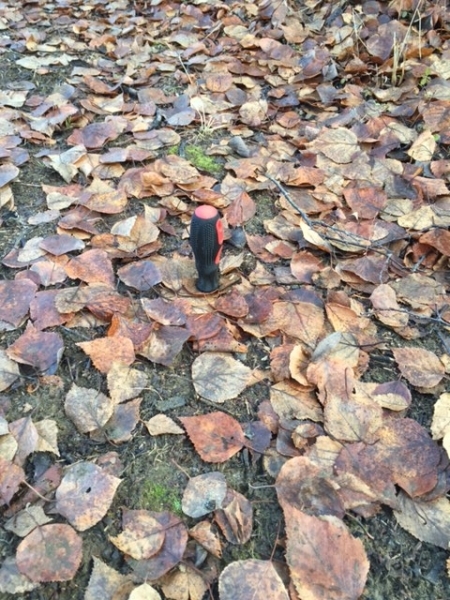 In the case of a switchback series or a loop, using tape creates a more visible and less confusing set of controls than small pin flags set into the ground. In the same way, sometimes it is useful to control how riders approach a specific corner or obstacle. You may have the intention of forcing them to dismount, or to take a specific and more challenging line. In this regard stakes and tape control the riders much better than pin flags. Surely no riders would ever cross the pin flags, but the path created by the stakes an tape is a much more controlled line. To set the stakes I first walk the course visualizing the line the racers should take. Then I lay stakes down with the tips where I want them. This method allows me to construct a smoother line as I adjust the stakes and create a pattern before hammering anything down. After the stakes are all set for a particular section I walk through setting the tape as efficiently as I can. 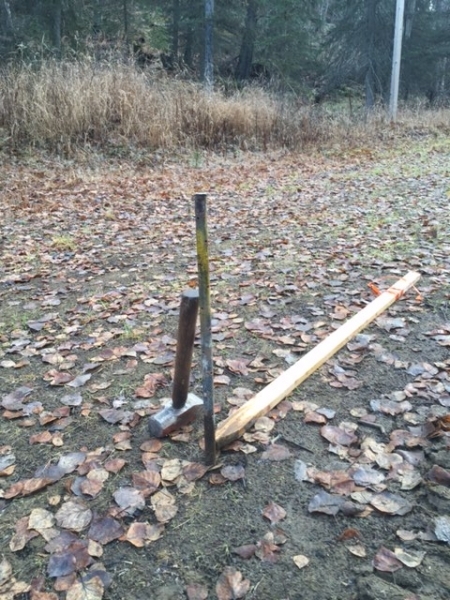 Sometimes when the ground is frozen a foundation stake is used to drive in a pilot hole. The next step is to flag out the rest of the course with the pin flags. This is the easiest part, and can be accomplished by bike. I load a backpack up with pin flags and a screwdriver and ride around. I take special care to note any confusing trail intersections or places where a path may diverge. These off shoots I flag, hoping to keep every rider on course. 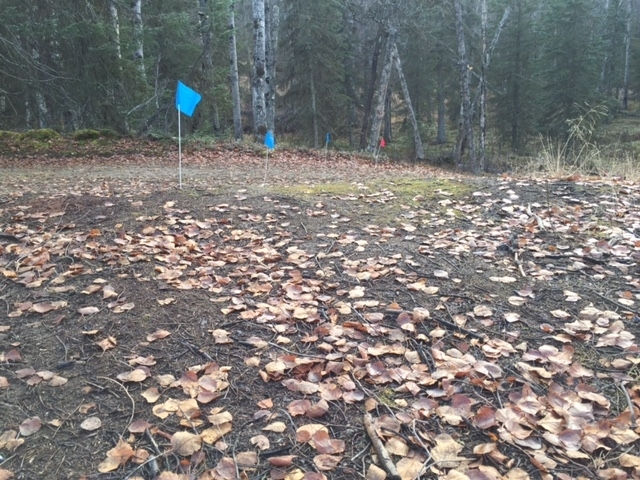 Any spot where the course uses the same section of trail, but doesn’t U-turn, I use pin flags to split the trail. Using pin flags also extends the life of the stakes we use, as they tend to split and shatter after a certain number of uses. For any given flag the process is simple. Take the screwdriver and punch a pilot hole in the ground. Then insert pin flag. Take a couple steps and repeat the process. When I’m done flagging the course should be nearly finished. It may seem confusing to riders who arrive early to preview. But once they are on the course heading in the right direction it should flow seamlessly and without any moments of confusion. Sometimes this requires more flags, sometimes less. The last thing I do before the race is install the barriers. 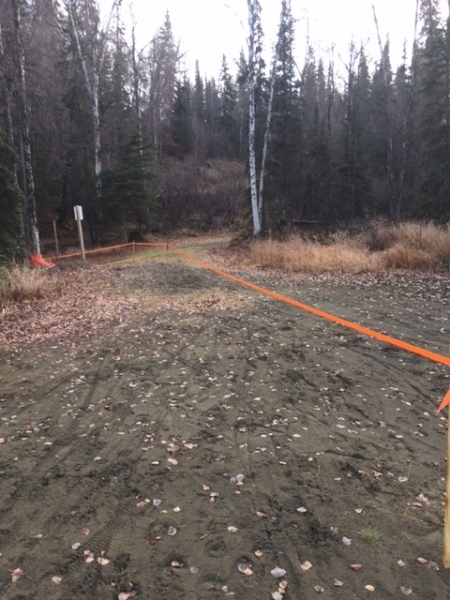 Depending on what part of the trails we’re using and where on the trail the barriers sit, I may set them up earlier. My biggest fear is someone who is using the trails recreationally not seeing the barriers and having an incident. The easiest way to control this is to set up the barriers closer to the race, when the race in progress have been set up and it should be clear to all users that there is an event happening. 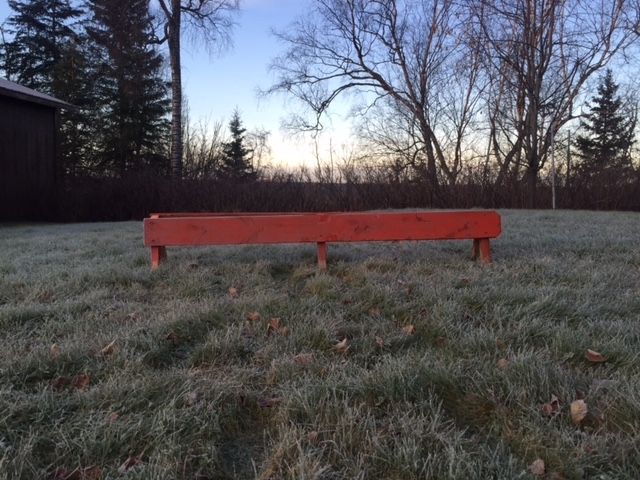 The smaller barriers have built in stakes and the larger use metal stakes repurposed from construction work. 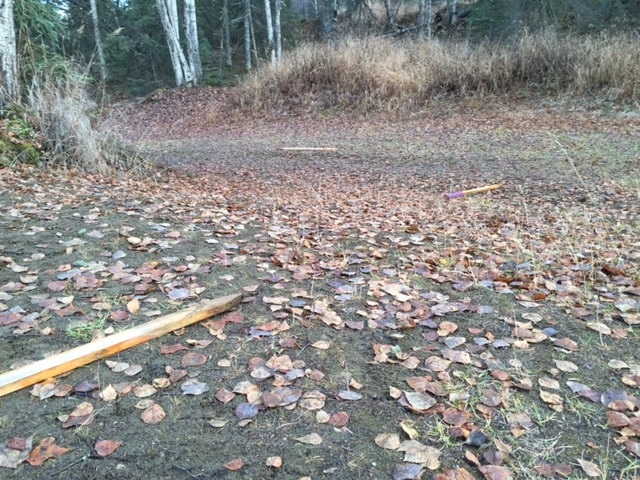 Once they are hammered firmly into the ground and rider proof, the course is set and ready to go. All that is left is to start the race, time it and produce results. But those subjects are for another time.